The other week Harry turned 7, and for his party this year I offered to host a Minecraft themed party. He was delighted with the idea, and so I did the best that I could to give him a fun party! It was the first time that we'd held a party for friends at our house so I was a little bit daunted, especially when we ended up with 16 children coming round, but it went really well, I had some great helpers, and everyone seemed to have a good time. The planning started well before Christmas when I began coming up with ideas for Minecraft party bags. 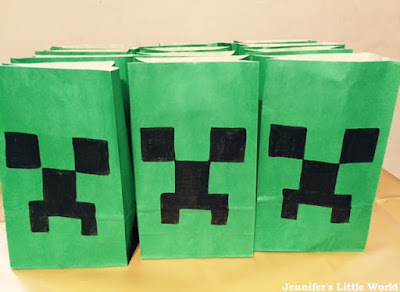 I was a little stumped at first, but once I got started I came up with lots of ideas, so many that you can find them all in a separate post - ideas for Minecraft party bag fillers. The day before, we began decorating. I saw these fab balloon and crepe paper spiders over at Adventure Mummy and made one for the hallway and one over our fireplace. I also bought green crepe paper in two different shades and cut long strips which I hung from our living room and study doors to make vines. These were very popular and after the party have been transferred to the children's bedrooms where they are still hanging! On the door you can also see the fab Minecraft pig which my friend's husband printed out for us. We used him to play Pin the Tail on the Pig with named strips of pink paper. I also hung bunches or green and black balloons around the house. The part of the party that I found the most difficult was coming up with games to play. As well as the Pin the Tail on the Pig I did a pass the parcel and I made up a scavenger hunt by printing out and laminating Minecraft pictures which the children had to find hidden around the house. This was really popular! We also played the chocolate game, where the children sit in a circle around a bar of chocolate and take it in turns to roll dice. If they rolled a six they had to put on a hat, scarf and gloves, then use a knife and fork to eat as much chocolate as they could. They managed really well with it! I also printed out some Minecraft colouring sheets and left them on the coffee table with some colouring pencils and crayons (not felt tips!) and they were really popular. In our downstairs study I put out our large boxes of Lego and Duplo and this was also a good idea. It gave some of the quieter little ones somewhere that they could retreat to if they needed some peace. For food and drink I went for standard party buffet fare. I did buy some cookies as I know that they are in Minecraft, and I also found some boxes of snacks in little block shapes like flapjacks which fitted the theme. For the birthday cake, my friend made Harry this magnificent Minecraft cake. It's covered in little squares of fondant and it must have taken her ages! On top of the cake is a little Minecraft figure which fitted perfectly. I hope that I've inspired you if you are planning a Minecraft party yourself! You can find more ideas on my Minecraft Party Pinterest board. How fantastic! My girls are crazy about Minecraft and would love a party like this. You had some great ideas.